We want to make you shine with our design! Our goal is to promote the companies and ideas that help our customers connect with their clients. Anderson Graphics offers the talent and professionalism of a large graphic design firm with the flexibility and personal attention of a local partner. We offer an array of design services, including, but not limited to, logo development, brochure creation, handbook layouts, and book design. If you are seeking a printer that provides printing in northern Illinois, the one that offers high quality, fast turnaround, and dependability you can trust, you are in the right place. 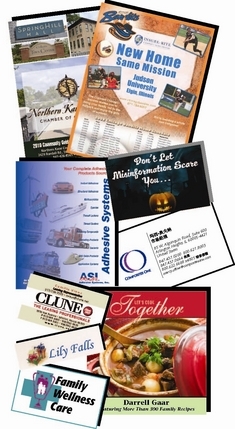 Anderson Graphics, Inc. is a full service print services company in Elgin, IL. Brochures, catalogs, stationery, NCR forms, checks and much more, we print it all. We hope to earn your business by providing you with extraordinary value, exceptional customer service, and by demonstrating a sense of urgency for your printing projects. Sometimes our clients’ needs are out of the printing mainstream, and we can handle those as well. Indoor/outdoor banners, flags, CD duplication/replication, trade-show items are among the many unique items that we have created for our clients. Translation—we have translated collateral materials, manuals and handbooks into Spanish, French, German and other languages. Chinese and Japanese as well! Need to reach every resident in an area; business by sales volume or number of employees? We can acquire or use your mailing list, print your material and get it to the post office on time! Let’s get started on your next project today! Click below . . .
"We had Anderson Graphics design our corporate brochures. They really turned out great and we look forward to working with them again!"